Salvation: Is It Relevant in 2017? "There will be people cast into the pits of Hell, crying 'oh, Lord, we didna ken!' And the Lord will reply, 'well, ye ken noo!'" The obvious angle of approach, I suppose, is to persuade people that they are wrong by urgently preaching about the wickedness that truly does abide in each person's heart, leaving them vulnerable to temptation, and about the eternal consequences of indulging that sinful inclination. It is important that this path is pursued vigorously but Christians should have more than one string to their bow. Another line of argument can, I think, be found if we consider the significance of the words "in Him" from the text. To be saved is to be in Christ and to have Christ in us. "Being Christian is not the result of an ethical choice or a lofty idea, but the encounter with an event, a person, which gives life a new horizon and a decisive direction." (Pope Benedict XVI) When we rest in Him life is transformed, we see things and people and our very selves differently. We have entered into a new relationship. We are in love and will be so for eternity. That is what salvation is. It is no coincidence that the romantic language of lovers mirrors the language of our salvation relationship with God. The first is an as yet imperfect icon of the second. As the Pope Emeritus put it "God is the absolute and ultimate source of all being; but this universal principle of creation—the Logos, primordial reason—is at the same time a lover with all the passion of a true love" When He saw our estrangement from Him this desire He has for us led Him to travel the infinite distance from divine glory to abandonment, shame and death on the Cross for no other reason than for to win us back to loving Him. He does not dazzle us with His power but He shares with us our vulnerability and weakness. As romantic love changes into conjugal love over time so our life in Christ alters from our first experiences of it. We discover "in drawing near to the other, it is less and less concerned with itself, increasingly seeks the happiness of the other, is concerned more and more with the beloved, bestows itself and wants to “be there for” the other. "(Deus Caritas Est 7) Since God is not physically present to us here below we can only, as it were, do good to Him through our neighbours whom He loves as thoroughly as He loves us. This then is the beginning of salvation, to experience in our limited way infinite love here and now and to share that infinite love with all those, both the good and the bad, who are around us. The end of it is to experience the same in an unlimited way for eternity. Is salvation relevant to you, now, today? Of course it is. 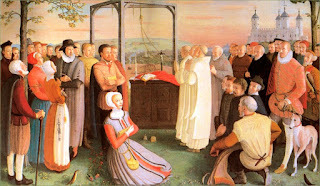 The earliest martyrs of the English 'Reformation' begun by Henry VIII were Carthusian monks. They were executed because of their loyalty to the Apostolic See in Rome. There is something richly symbolic in the fact that an order which is committed to contemplating the things of God and whose motto is Stat crux dum volvitur orbis ( the Cross stands firm while the world turns) was the first to apprehend what Henry's plan would lead to. Another monastic order, the Benedictines, have as the first words of their Rule "Listen carefully." This word 'listen' may indeed be the Benedict Option which the world, and particularly the Christians who inhabit it, may most need to exercise. Paradoxically the best environment to enable one to hear is silence. We are accustomed to making our decisions, big or small, in the midst of a cacophony of noise. Not simply the external noise generated by things but also the internal noise generated by our mind's leaping from thought to thought, impulse to impulse, stimulus to stimulus. The choices so made may be good or bad but they share one characteristic; they are hurried. What appears before the eyes of our mind is the obvious and the material and it is from those things that we draw the primary conclusions which prompt us to act. The world, and we ourselves, are made up of a fine web of subtle and invisible things. We see them if we look and hear them if we listen but whether we see and hear them or not they are there and they are of the most vital importance to us. We cannot then fully understand ourselves or the world if we are continually in hurry mode. To get behind the noise we must stop and listen to the silence. It is in silent listening every day that we can begin to hear what the Lord God speaks in us. He speaks through the material universe, through the world of men and of events and through our friends and acquaintances. He speaks too, and that most profoundly, through the Sacred Scriptures, the Sacraments and in the prayer of contemplation. 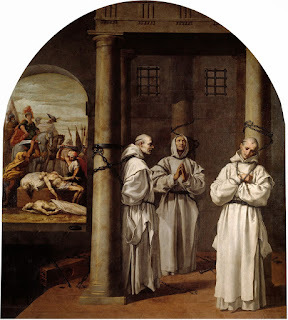 It is, perhaps, because they listened above all to these things that the English Carthusians perceived long before the practical men of politics did that Henry VIII was hell-bent and so, ultimately, would be those who went along with him. At His appearance by the Sea of Tiberias there is one Apostle who recognises the Risen Christ ahead of all the others 'That disciple therefore whom Jesus loved, said to Peter: It is the Lord' (John 21:7) Quick-eyed love is more clear sighted and faster to apprehend than any other of the senses when it comes to the beloved object. Although the Evangelist talks of the love that Jesus had for the disciple not of the disciple's love for his Lord there can be no doubt that it was a mutual relationship. God loves each of us infinitely but we experience that divine hunger for us in different degrees according to what is in our own soul. The powerfully felt and strongly expressed love of St John for the Christ called forth such a strong response from Jesus that His love for the Apostle was apparent to all. The same principle was at work in the events of the first Easter morning. Mary Magdalene became witness to the Resurrection and Apostle to the Apostles because her passionate and chaste devotion to Him drew her to seek Jesus and drew Him to show Himself to her. 'For thee my flesh and my heart hath fainted away: thou art the God of my heart' the psalmist had said (Psalm 72:26) and the Magdalene lived these words with her entire being. Tradition has applied to her the words 'Many sins are forgiven her, because she hath loved much.' 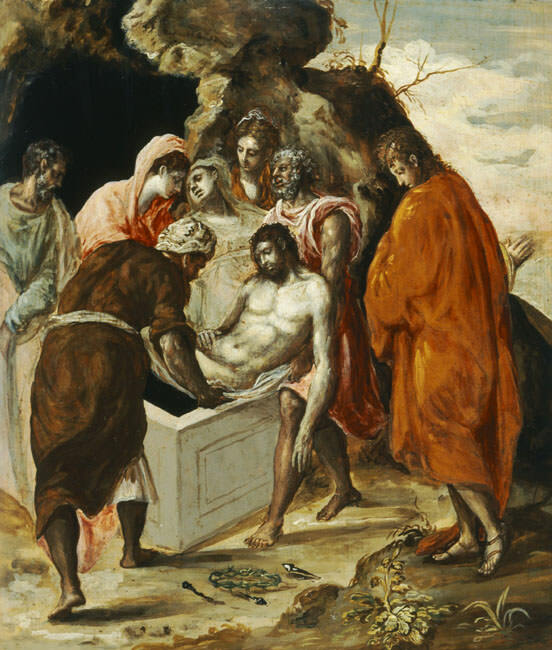 (Luke 7:47) and also ' Mary therefore took a pound of ointment of right spikenard, of great price, and anointed the feet of Jesus, and wiped his feet with her hair' (John 12:3) Modern scholars question this interpretation of the texts but the Christian ancients intuited a great truth which academics don't concern themselves with. 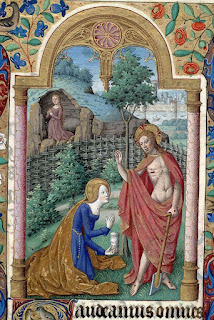 That is, Mary Magdalene received the unique privilege of becoming the first recorded witness to the Resurrection not by happy chance but because her consuming, burning, fiery love for Jesus the Saviour gave her the position of first among equals of all those who had come to know Him since His Nativity. This bright love,though, has its dark places. The Magdalene came to the joy of the Risen life by travelling through the valley of the shadow of death. Because she loved so much she suffered enormously on the hill of Calvary when her beloved had died an agonising and shameful death. 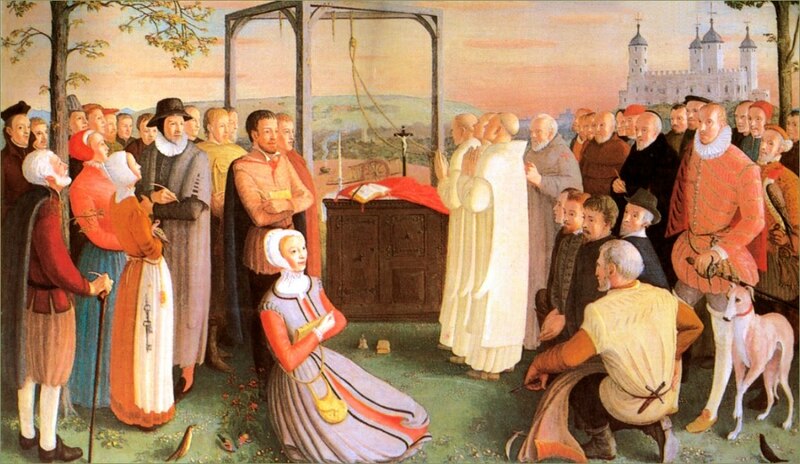 Long and dreary too were the bleak hours that passed between His entombment and that moment 'very early in the morning, the first day of the week' (Mark 16:2) when she became the glad bearer of Good News that the world had changed forever. She bears witness too that for all of us however close we may be to the Lord (or think ourselves to be) there will be no Crown if there has been no Cross. Catholic Scot has a Facebook page. The picture is Noli Me Tangere from a 15th Century Paris Missal. Wikipedia tells us that 'Lectio Divina (Latin for "Divine Reading") is a traditional Benedictine practice of scriptural reading, meditation and prayer intended to promote communion with God and to increase the knowledge of God's Word. It does not treat Scripture as texts to be studied, but as the Living Word' Which, I think, means that we need not be overly bothered with context but that if we find a passage, clause or word then we hold it in our mind and simply gaze at it with the eyes of the heart. That is to say, we don't do the intellectual analysing which we might do in other situations but we hear it as a lover speaking out of the fulness of His heart directly to our own heart. I abode in the wilderness. 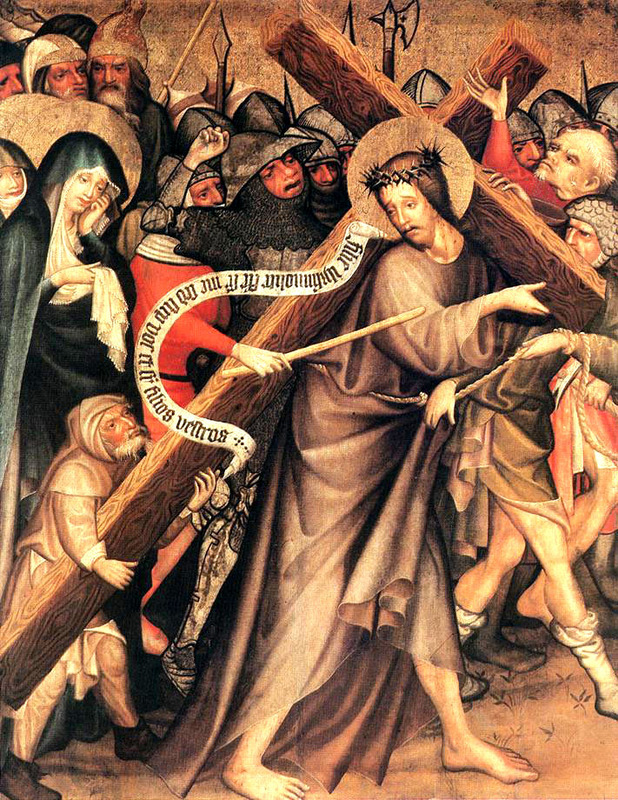 On the Cross our Lord told the penitent rebel "I say to thee, this day thou shalt be with me in paradise." (Luke 23:43) The Creed informs us that Jesus descended to Hell that same day from which we can conclude that paradise is where He is. The opposite case, then, is that where He is absent we are cast out into the wilderness there to wait His coming. When we, by mortal sin, kill grace in our soul we place ourself apart from Him in the desert. Sometimes too we experience abandonment even when we have done nothing amiss since such is the Father's will for us. In either event all we can do is compose ourselves to wait for the One that has saved, is saving and will save us, our dear Lord, Jesus Christ. An icon of this text is the Blessed Virgin Mary on Holy Saturday that agonising time between the burial of her Son and His rising again. Of the first of those events she was certain with the certainty of sight of the second she had only the certainty of hope for things unseen. In the wilderness, without Jesus, waiting in sorrow and in faith was all that she could do. How often during that day must she have said 'O Jesus, O my Jesus, O Jesus' Words that came from the centre of her grief laden being. Repeated over and over with an emotional and personal force that came from more than thirty years of loving relationship with her Divine Son. The word Jesus had for her all the associations that flowed from the great joy of Annunciation and Nativity through the hidden years to the apotheosis on Golgotha. There is much debate about the use of mantras in Christianity but if we could say them as Mary said her Son's name on that day of darkness we would be nearer to heaven than we are. As we can't it might be wiser to use the texts and prayers that our mother the Church gives to us. At all events full of grace and virtue as Our Lady was she still had to abide her sorrow in patient waiting. The gifts of God come to us when He wills to send them. We cannot call them down simply by the strength of our own efforts. We must give of ourselves in our sorrows and in our joys and then wait.The Spirit visits us not because we deserve Him but because we need Him and He comes only at the times which He knows to be best for us. Until then we are in the wilderness, but we do have this sure and certain knowledge, the One for whom we are waiting loves us more than we can possibly love Him and His blood has been shed for us. 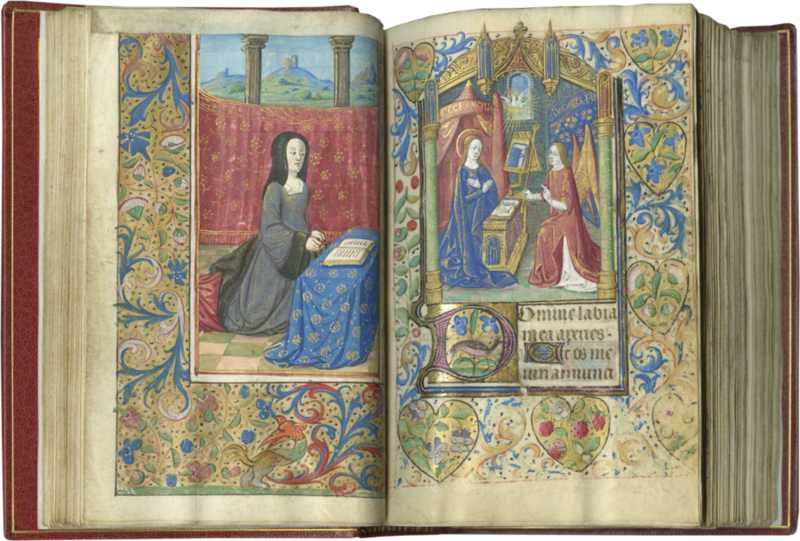 The painting is in a Book of Hours from the Workshop of the Master Francois. "My son Absalom, Absalom my son: would to God that I might die for thee, Absalom my son, my son Absalom." If David was nearly destroyed with grief over the death of his guilty child how much more must Mary have suffered in being bereaved of her Innocent One? In the modern era there is a distaste for the focus on the sheer physicality of the Passion and Death of Our Lord that characterised so much earlier piety. It is felt to be morbid to spend so much time considering every aspect of His suffering and the attention paid to the empty shell of His corpse. After all, it is reasoned, the main point of His mission was the teaching He gave us and the reconciliation He wrought for us in the heavenly places. This is a dangerously misleading approach to take. The entire essence of the economy of salvation is that the Word became flesh and dwelt among us. If Jesus had been crucified without giving the Sermon on the Mount we would still be saved, if He had given the Sermon without being crucified we would still be lost. His body matters. A lot. Of course He did both, and we should never consider the two things, His teaching and His suffering apart from each other. When Mary hugged the body of the dead Saviour close to her Immaculate Heart she was not only transported with her own unimaginable sorrow she was also acting as our plenipotentiary. We to need to come near to the Man of Sorrows in all His humanity as well as in all His divinity. Jesus had said, referring to His body, "Destroy this temple, and in three days I will raise it up." (John 2:19) About the Temple of Solomon the psalmist had sung "Its stones are dear to your servants; its dust moves them to pity" (Psalm 102:15) If the Spirit of God had moved the children of the Old Covenant to sigh over the very dust of its Temple how much more must it move us to join with Mary and lament over the bruised, battered and pierced body of our own most lovable and eternal Temple, Jesus Christ. Hail Mary, who fully entered into the agony and death of your crucified Son. 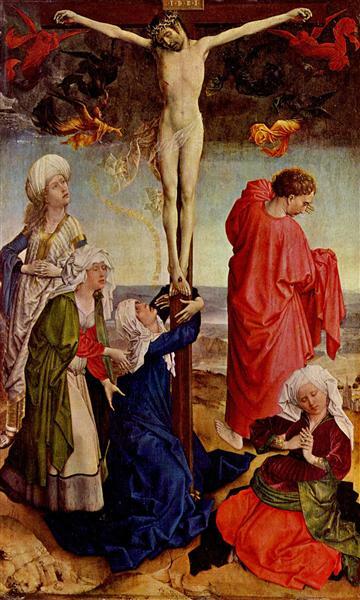 St John is the only Evangelist to record the presence of the Blessed Virgin on Mount Calvary. He too is the only witness for her role in the wedding at Cana where Our Lord's public mission began. At that time Mary's compassionate heart was moved at the thought of the suffering the newlyweds would endure if they were shamed by being unable to provide for their guests. And what of Mary's immaculate and compassionate heart now as she watches her beloved Son die slowly in front of her eyes? Then she had said "they have no wine." Now the Precious Blood of Jesus flows like the new wine of the new covenant. Then she had instructed the servants, and through them all the Church for all time "Whatsoever he shall say to you, do ye" (John 2:1-11) Now it was His will that she should fully enter into His agony, and what He willed, she did. So complete and total was her perfect love for Him that not only the gross suffering of His Passion- the nails in His hands and feet, the thorns pressing deep into His skull, the raging thirst- were felt by her but every single breath, every bead of sweat rolling down His skin, every flicker of emotion from compassion to abandonment which He felt was felt with equal force by her, His afflicted mother. 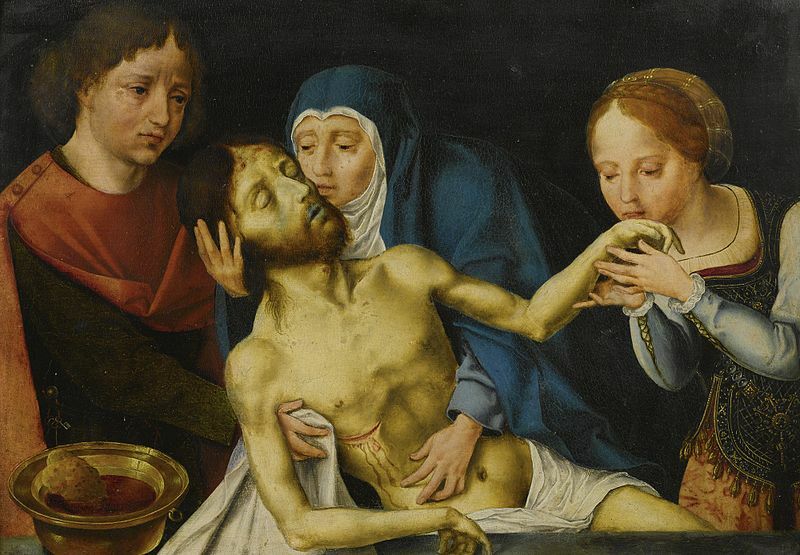 Theologians tell us that, were it not for a supernatural act of power by the Spirit, Mary herself would have died on Golgotha so completely was she immersed in her Sons final agony and bitter death. At Mary's instigation the nuptial feast at Cana had been the gateway to the public career of Jesus. 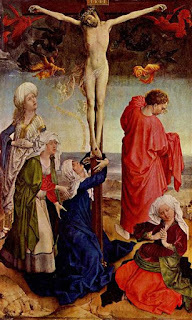 At His instigation the Cross at Calvary has become the gateway to the "marriage supper of the Lamb" (Apocalypse 19:9) His Body and Blood are the foundations of our feast in the Eucharist and the reason for our hope in eternity. The Apostles consumed Him under the appearance of bread and wine at the supper of Holy Thursday. Mary, His Mother, whose flesh was His flesh and whose blood was His blood consumed Him and was consumed by Him through her most perfect union with Him on that darkness-shrouded hill. That union has never been broken since which is why we can approach Mary in prayer with such perfect confidence. There are many reasons why Jesus will listen to her petitions and not the least of them is the unbreakable bond formed between them on that dreadful day. Hail Mary, who deeply distressed encountered your cross-bearing and suffering Son. It is one of the mysteries of love that the presence of a beloved one can both increase and diminish suffering at the same time. For Jesus it would have immeasurably added to His affliction when He saw the anguish His mother experienced when she saw Him. It was also infinitely consoling to Him to have the one He loved and honoured above all others near at hand and touching Him with her total compassion. Similarly, for Mary it was exquisite agony to see Jesus sinking under the dark weight of the world's sin. Yet it was, too, a source of strength for her to feel that He knew and appreciated the depth of her love for Him. This highly intense drama lasted for only a few seconds and most people on the Via Dolorosa would have known nothing about it. Yet what immensity of feeling, of emotion and of perfect love was packed into those precious instants. The agonies of Christ in Gethsemane and on Calvary lasted for longer but they never sank deeper into pain or rose higher in silent appeal to the Lord and Father of all. And how could there be? To see your beautiful, perfect Son being led away to a shameful and painful death after having been tortured, mocked and unjustly condemned, knowing that there is nothing you can do to save Him. What anguish! What torment! And to know also that this is far from the end of both His sufferings and yours. Ahead lie the hours on the Cross and the final mystery of death. Hail Mary, who for love of your Son fled into darkness and exile. There is a world of frantic activity covered in the few words Who arose, and took the child and his mother by night, and retired into Egypt. It is also a sadly familiar picture. Thousands of times over the centuries families have been roused at night and hurried out of house and country through fear of the Gestapo or Islamic State of their day. We can picture the scene, Joseph wakes the sleeping Virgin and after a some hurried words of explanation they pack their few small belongings together with whatever food and drink they can collect, lift up the sweetly sleeping infant Jesus and head out into the darkness for an unknown destination. In the 21st century it may be difficult to fully comprehend the significance of their escape commencing at night. There were no electric lights, no headlamps, only the moon and the stars often hidden by clouds. 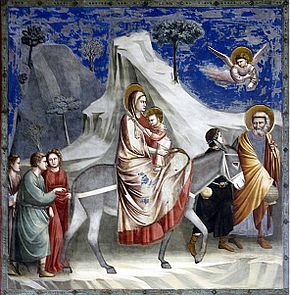 Especially when travelling over unfamiliar roads alone and without a guide, as the Holy Family were, it was a course of action so hazardous that only the extreme nature of the danger they were escaping could justify it. Imagine the state of mind of our Lady. She went to sleep with her beloved Son near at hand, St Joseph providing for them both, the memory of the visit of the Magi fresh in her mind and only the prophecy of Simeon casting a vague shadow on her happiness. Then within an incredibly short time she finds herself, baby in arms, travelling through an impenetrable blackness towards a strange and hostile land pursued by a malevolent hatred whose nature she, the sinless one, the pure one, the loving one, could not begin to comprehend. It is significant that in this situation the Blessed Virgin unhesitatingly trusted herself and her Jesus to St Joseph. She did not doubt his testimony anent the Angel's warning and she did not doubt his ability to protect and guide them through the difficult times that lay ahead. 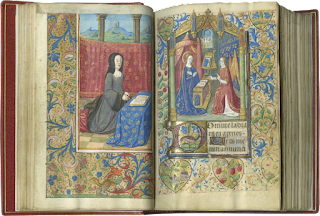 In her life Mary not only illustrated the beauty of loving devotion to God but also the importance of the family as the strong basic unit of human life. To love the Divine One is to love ones neighbour and to share one's life with others in a continual mutual giving. Being driven into sudden exile was a great shock and sorrow to Mary, bringing a thousand worries and fears in its wake, but she had the consolations both of Grace and of nature through the constant protecting love, in their different orders, of God and of her husband. The Evangelist John, to whom Mary was an adopted mother by the express instruction of Jesus, wrote "If anyone says, “I love God,” but hates his brother, he is a liar; for whoever does not love a brother whom he has seen cannot love God whom he has not seen" (1 John 4:20) No Christian can look upon the second sorrow of Mary with true sympathy and love if they harden their hearts against those who today are driven from their homes by fear of persecution and death. Christ is present in the midst of all suffering and Mary, His Mother, is with Him. You will be sentencing them to another exile if you fail to extend to hand of neighbourliness to the refugee who flies to your country, your city, your street. You cannot truly meditate on the things of God with your mind if you do not perform the actions God requires of you with your body. Simeon blessed them, and said to Mary his mother: Behold this child is set for the fall, and for the resurrection of many in Israel, and for a sign which shall be contradicted; And thy own soul a sword shall pierce, that, out of many hearts, thoughts may be revealed. Hail Mary, who accepted that your own soul would be pierced by a sword for love of your Son. There are forty days between Christmas and the Presentation in the Temple. Out of the thirty-three years that Mary was mother to Jesus on earth these were the only days of unalloyed joy. After that she could never be entirely clear from the shadow of the Cross. Doubtless there were many moments, perhaps whole weeks when the shadow was only at the back of her mind but it never departed entirely. She knew. She could not help but know. Her beautiful Son would be a source of scandal to the world and because she loved Him so entirely everything which fell upon Him would fall upon her also. Since humans are weakened by sin and by their vulnerability to temptation human love is an imperfect thing. If we examine it closely we see it is a compound made up of a mixture of emotions and desires, some selfless some demandingly selfish. Mary was sinless so her love was pure and therefore perfect. She loved her Son as no other mother could love a son. This meant that the pain she felt when He was hurt is something beyond the scope of our sinful human imagination to grasp in its entirety. This applies also to the pain by anticipation which she would have experienced when she heard the words of old Simeon and on the many occasions afterwards when she would have pondered them in her heart. 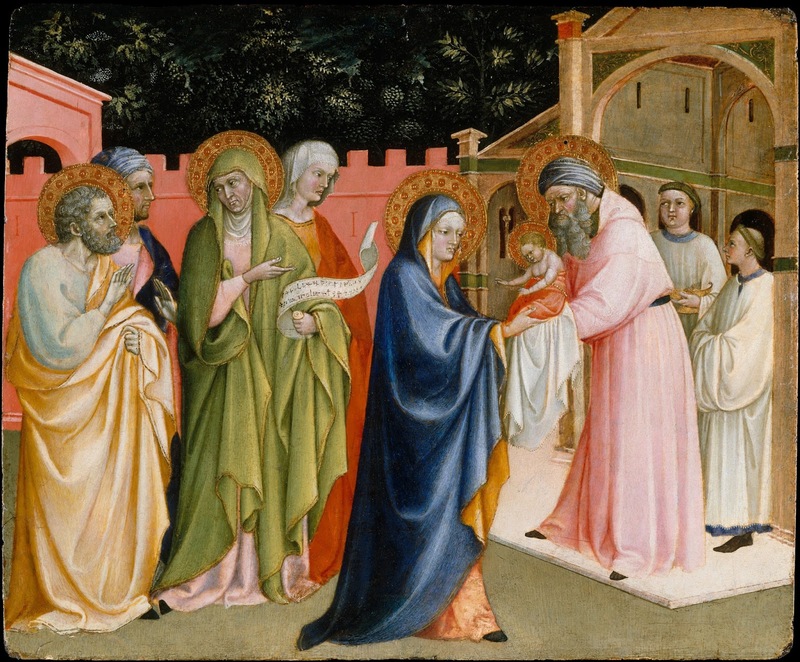 When Mary uttered her fiat to Gabriel "Behold the handmaid of the Lord; be it done to me according to thy word." (Luke 1:38) she did not know in detail what it would entail but she did commit herself freely and completely to do the will of the Father in everything concerning the mission He had entrusted to her. From Simeon she had now learnt in part what this would mean. This did not cause her to retreat from or to regret her commitment. Flesh and blood might not be able to face up to such an ordeal, it would seek to escape or be crushed by despair. But Mary, like all of us, was more than mere flesh and blood she was spirit too and in her case spirit full of Grace. God who sent her both the gift and the trial also sent her, in the Holy Spirit, the means to endure and to triumph. Her obedience to the Father, love of the Son and strength from the Spirit would help her in her sorrow. If we, now, today, in the 21st century gaze upon the Blessed Virgin as a mirror for ourselves then, learning from her, imitating her and imploring her intercession we too can fulfil our particular missions relying not upon ourselves but upon Mary's Son, our Lord and Saviour Jesus Christ. Hail Mary, whose Son was hidden from you by the darkness and silence of the tomb. The One who was the Light of the World and the light of her Immaculate Heart had been sealed into the total blackness of the sepulchre. Only God, in His power and compassion, could console her now. What did she have left in the world. All was gone. All gone. Now there remain faith, hope, and charity, these three: but the greatest of these is charity. (1 Corinthians 13:13) Bereft of everything else Mary still firmly possessed the three theological virtues, which by the Grace of God she held to a superlative degree. Properly speaking faith is not belief in a thing; it is trust in a person. Had our Lady not, even as a girl, been firmly united in faith to the Father He would not have entrusted her with the privilege of becoming mother of His Son and our Saviour. That faith never wavered even in the bleakest moments of the first Good Friday. It stayed with Mary and strengthened her as the stone closed over the corpse of her beloved Jesus. "He shall be great, and shall be called the Son of the most High; and the Lord God shall give unto him the throne of David his father; and he shall reign in the house of Jacob for ever"
Mary did not know how these promises could be kept in the wake of the seeming total failure of her Son's mission and His shameful and agonising death. That they would be kept she knew with the firmness of a supernatural hope. Her part was to await their fulfilment and this she would do in the presence of sorrow but the absence of despair. And charity, caritas, love. 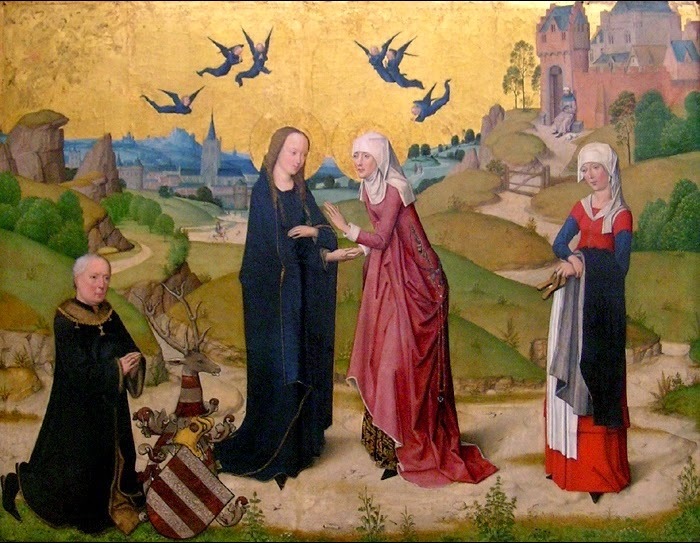 The compassionate Virgin had around her the Holy Women, not least the inconsolable Magdalene, as objects for her outgoing, generous love even in calamity and as sources for incoming consoling love at her time of greatest need. She had the young St John, a new son for her as Jesus had said. And more than these she had her love for the Christ, her child. A love too powerful for death to overcome. Too powerful to end in time. A love, she knew which would shine throughout eternity, living and unconquerable. As that love had so recently led her to stand at the foot of the Cross now it would lead her to wait for Him to redeem the time and to re-unite Himself to her. And so, Mary waited.